We’re in the middle of corn season and I find myself looking for new ways to take advantage of the bounty. I was very pleased at how this recipe turned out, the vibrant acidity was the perfect foil to the juicy aged steaks – and it was so easy, if you have good ingredients. Read on for the recipe, tips and a short video with a step-by-step guide and tips for grilling a great steak. 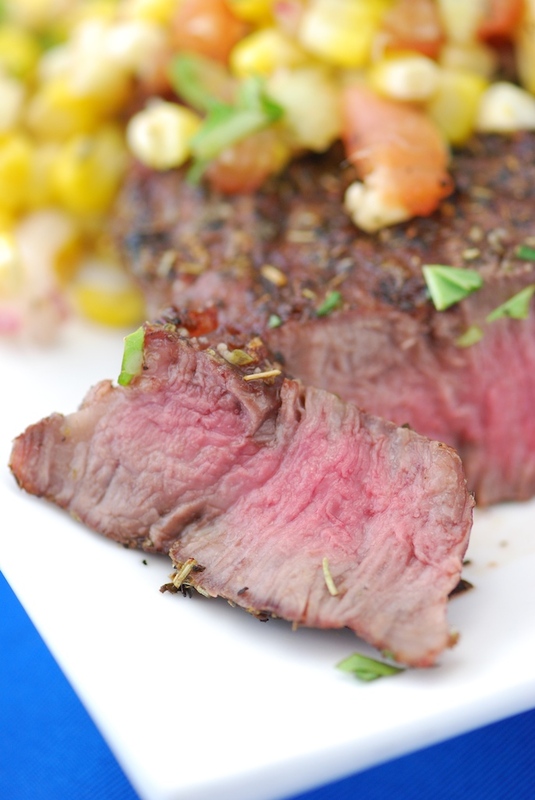 Steak encrusted with Italian Herbs with a fresh grilled corn salsa – easy and delicious! Start with a great steak – Premium Choice to Prime grade and aged at least three weeks. Dab steaks dry and rub with a combination of olive oil, garlic and my Tuscan Grill Rub. Rest steaks at cool room temperature for up to 2 hours. Grill slightly under the actual finish temperature you desire and then let the steaks rest, covered with foil or parchment and a towel, for about 10 minutes before serving. Toast corn lightly, long cooking can dry it out. Grilling the veggies reduces the water and the skin falls right off the tomato. Choose a great olive oil and genuine Balsamic di Modena – which is also great for dipping. Prepare an indirect grill (direct medium to high heat on one side, low to medium heat on the other side). Dab steaks dry. Combine garlic with 2-3 TBS olive oil and brush on steaks. Sprinkle steaks generously with Tuscan Grill Rub, to taste, and rest at cool room temperature as you prepare the salsa. In a large, non-reactive bowl, combine the onions and the vinegar and set aside. Brush corn and sliced squash with oil and sprinkle with pinches of Tony’s Tuscan Grill Rub, salt and pepper. Slice Split tomatoes. Grill corn and squash over direct heat to toast lightly on all sides, turning regularly – about 8-10 minutes depending on conditions. At the same time, grill tomatoes, skin side down with indirect heat to soften and lightly char skin. Remove and cool. Pull the skin off of the tomatoes, chop and add to onion. Cut the kernels from the corn and add to the onions. Chop the squash and add to the onion along with the basil and a good drizzle of olive oil. Taste and adjust with Tony’s Tuscan Grill Rub, salt and pepper. Rest at room temperature until ready to serve. Once the corn and onions come off the grill, begin grilling steaks – cook as desired, remove and rest for 5-10 minutes before serving topped with spoonfuls of the warm corn salsa. Great served over polenta and fresh spring greens or arugula. Great looking meal! That steak looks absolutely perfect!